Here are the three finalists for the Ten Truths mini-setting contest. Please vote for your favorite before the end of December 7th. 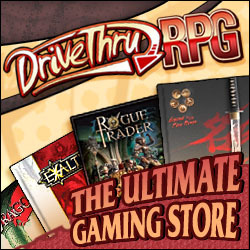 The first place entry will get a $20 gift certificate to DriveThruRPG, second place will get $10, and third place will get $5. Planets are the huge, calcified final stage of a single-celled organism known as Arclite and every planet has one at its core, binding it together. The Arclite of our world has become infected with an unknown disease, weakening it severely and causing the planet to fragment into a sphere of rocky island chunks. The oceans drained towards the Arclite’s exposed core, creating a spherical ocean that is known as the Underdark because it exists in the permanent shadow of the land formations above. The survivors of this apocalyptic event now endure a constant, day-to-day struggle as tribal wars, killing, banditry, ritual sacrifice to new gods, and enslavement become commonplace means. Life is dominated by three all-important resources: farmable land (scarce), water (which must be siphoned at huge cost from the Underdark) and bridges (which link the rocky islands and generate wealth with the huge tolls they demand for passage). With their forest homes withered and dying, wood elves have been easily subjugated and have become the world’s primary slave race. A conglomerate of human interests runs most of the world’s most crucial bridges, but a separate element exists that wishes to see the human empire restored to the glory that it had achieved before the calamity took place. There are rumors of a dwarven city that floats on the Underdark, built with whatever derelict ships and boats could be found on that sunken ocean. The vast, salvageable stockpiles of weapons, armor, and other artifacts leftover from the former world have created an intricate subculture of pirates and treasure hunters. Ultimately, the Arclite core is still dying and if its roots’ fragile hold on the world should fail, Ilcia would disintegrate and all living things that remain would finally die. 3,000 years ago, the gods lost their connection with the world of Aveda. Magic slowly faded from the world and technology was barely improved. 600 years ago, Princess Pash gave her life in order to save her nomadic people of the deserts. Her soul transcended and became a new god through the faith of her people. Since then, more souls have filled the pantheon of Aveda. Kalit is an island continent located in the far south of the world of Aveda, and it is host to three different kingdoms: Pakal, Mira, and Palenque. Kalit used to serve as a center of commerce between the two largest continents on the world, Sair and Isiel. After a great tsunami 50 years ago, ships stopped coming into Kalit and no sailor who has left Kalit has returned since. Mira is the region that suffered the most from losing contact with the other continents because most of its income was received from the sale of gems and spices that it used to buy food from the outsiders and other kingdoms. Since the tsunami, Mira has been spending resources to try to improve its harvest and get more supplies from the sea, however they have a lot of people to feed. The king of Mira, Hurrah, is forming an army convinced that the only way to solve the problem of his people is through the conquest of the other two kingdoms. News arrived to the city of Dante that the kings of Pakal and Palenque are reinforcing their frontiers – a spy is suspected to be part of the court of the king. Prince Balam is convinced that he can restore a ship in Dante and sail it into the sea. He has been requesting help from locals in order to restore trade, but few people wish to risk their lives and help the prince. In 3 days, the ritual of stars will be celebrated. Legends say that on the 3rd day of the ritual, the gods granted a wish to the high priest and blessed all the people in Dante. The ritual is celebrated every 75 years when the 3 small stars in the sky align with the old temple in Dante. The king has granted permission to perform the ritual, however many are displeased with this act that will waste the precious food of the kingdom. The rulers of several kingdoms are all being manipulated by shapeshifters and creatures with mind-controlling abilities and have been for several generations. The kingdoms are often at war with each other, which provides a distraction to the populous and culls the best and brightest from rising up against the powers behind the ruling class. “Evil” races are slandered, scattered, and shunned for they know the truth about the powers controlling the surface nations. The gods are manifestations of belief of the people. They do not interfere with the secret war between the surface and underground kingdoms because they are created via the propaganda and belief, thus not knowing of the true nature of the world. The Kingdom of Westlund is divided into dozens of earldoms, duchies, and baronies, several of which are being prompted to foment a rebellion against Good King Anders IV and the Good King’s loyalists. Three generations ago, Lord Anders’ Revolution was over when Anders I luckily defeated Queen Fayette’s larger armies and married (some say forcefully) the monarch, ending the maternal line of succession in a reunited Westlund. During the first years of Good King Anders’ rule, the capital was moved from Anascaul-on-the-Bay much further south to Anders’ home of Breilund. Duchess Adira, the elder sister of Anders IV, was married off to the Duke of Anascaul at the age of eight. She has grown into a young woman with the desire to restore the old line of succession and claim the throne. Anascaul-on-the-Bay has never recovered from the loss of the capital. There are crumbling ruins scattered throughout the city that is now a town. Crime and corruption run rampant. Within a few days time it will be the tenth anniversary of the Scourging, a local holiday recalling the Three Duchies’ defeat of a mighty of ogres and other foul beasts and their flight to the Mangerton Mountains. Visitors from across the nation and from further shores are expected.